I really like this quote. It provides a visual image of a very important point. The point is that you must be passionate to succeed. Being passionate centers every action and every choice around a specific goal to the exclusion of other considerations. After over 30 years of trying to understand my fellow human beings I have found that they are mostly not incompetent when it comes to making decisions, rather they are just passionate about other things even though they say or think they aren’t. If you are passionate about retiring early, all your choices must center around early retirement. The more focused you are, the earlier you will escape the need to have a job. 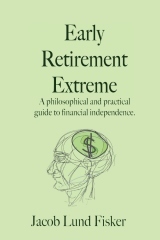 Economically speaking, early retirement is about being financially independent. We live in a cash economy, thus if you can generate sufficient cash flow to pay for your living expenses without working, you are by definition financially independent [of your job] and you can stop working. Like physical fitness, personal finance is not rocket science. The specific knowledge is very simple. The challenge is in showing up and keeping with the program. It is thus a motivational problem and many people are prepared to pay a personal trainer not for the trainer’s knowledge on exercise but because they feel guilty if they did not show up. However, if you are already passionate, you have already taken the biggest step. Give me a person who is $50000 in debt but is passionate about personal finances and I bet she will come out better than the person who is not in debt and is just going through the motions and putting 10% into a retirement plan. The next step is to go from ordinary to extraordinary. Obviously if you want extraordinary results like retiring 5 years from now or becoming an elite athlete, you can’t get there by adopting ordinary methods. Instead you have to proceed to the next level. There are less people at this level, thus these sources of information will be much harder to find. For instance, yesterday DW was looking at some new boots in some catalogue. I suggested that instead of buying a fashionable $50 pair that would self-destruct in about year to find someone who made really good boots and buy a high quality classic pair that lasts 10 years. However, she did not know where to get this and neither did I. I can however tell you where to get men’s footwear that just might outlive you. For men’s shoes try Allen Edmonds or Church. This is just one example. These ideas might be found outside the early retirement community. After all, when most people speak of early retirement for mortals e.g. not IPO millionaires, they mean before age 60, not before 40 or at 30. I recommend being eclectic and open minded when it comes to money saving and money making ideas and be prepared to drop your preconceptions. If the focus is early retirement, any idea that works is good. For instance, in trying to reduce my economic liabilities also known as “stuff”, my source of ideas to reduce clutter was originally based on suggestions from the ecological footprint community, then from the anti-consumer and voluntary simplicity movements. Later again I adopted ideas from the boating industry where space is at a premium. Japanese architecture is another good source for space saving designs. Conversely, TV-Shop is not. There are two conclusions from this. For every decision, consider whether your choice increases income generating assets or decreases regular expenditure. If it works against these goals, it works against your early retirement goal. If you figure out a way to not spend $1, you just saved $25. A penny saved is not just a penny earned. It’s a quarter (25c) earned! When you are passionate about early retirement, this way of thinking will become second nature to you. previous post: Can I retire with 2 million dollars? 22 users responded in " Passion "
Thanks for the references for durable shoes. I need some business-casual shoes for work and Allen Edmonds look great. They’re expensive yet look like a good value due to their durability. I really like that they can be refurbished too. I don’t know about Allen Edmonds refurbishment program, but Church’s is very expensive. I prefer cobblers even though that usually “voids the warranty”. A good cobbler is worth a lot. Many cobblers work like mechanics and just repair the shoes good enough to make you come back in a year. Some don’t though. Didn’t you have a post about passion being a bad thing in the work world? It leads to burnout, I think you said. Also, I know you’ve mentioned it before, but I still am not sure I understand this idea of multiplying by 25. Maybe you or one of your readers who understands it can explain it in a slightly different way that might make sense to my pea brain? @veganprimate – The 25x rule is based on the safe withdrawal number of 4% of the portfolio each year which historically has lasted 30 years if invested in the US market. Withdrawing 3% would have lasted “forever”. To withdraw X each each, then x = 0.04 * portfolio, thus portfolio = X/0.04 = 25*x. This is a repost. Passion is still the best way I know to get things done. It has its risks though. I haven’t burned out on the FI/ERE though (yet). If your annual expenses are $12,000. 25 * 12,000 = $300,000. @veganprimate – It should be noted that “survived 30 years” really means “survived 30 years with a _very_ high probability of success”; less money, like 20x, (representing a 5% withdrawl rate) will have a good probability of success… I think it’s in the 90% range. It is really difficult to find clothes and shoes for women that are durable. Maybe it’s because we tend to be more susceptible to the temptations of seasonal fashion trends or because we’re encouraged to look more delicate in general. I have been wearing just 1 slack of pants for over a year at my job now. I dry clean this every week for $1.25. Frugal? Even if ERE is not your main passion, you can still benefit greatly from the concept and a new outlook on your money. I almost re-enrolled my 3 year old in pre-school even though I am home and can teach her myself…by telling myself that it was ‘only’ $25 a day, but then I remembered that it was actually more due to paying with after tax $, gas, time traveling, gifts for teachers/aides etc. I think you accidentally swapped the income generating assets and the regular expenses in the formula above, which may have lead to the confusion. This is an excellent site with unique and useful content, but you really, really need a dedicated proofreader. Your writing is littered with minor typos and grammatical mistakes. I bought a pair if frye engineer boots eight years ago when I had a motorcycle. This is one brand that doesn’t go on sale. They have survived the road, Colorado winters and still look as great as the day I bought them (ok they have duct tape on them but it is inside and keeps the seams from snagging my nylons). I clean them with saddle soap and treat them with mink oil. I still wear them at least twice a week. I know the company makes some more fashionable boots with heels and such but the engineer boot suits my style quite well. Two I bought in the early 80s and each has been thru the refurbishment program 15-20 years ago. I have been very well pleased. They now sit in my closet with a hole in the sole and split leather on the side while I try to decide what to do with them. not so pleased with this pair and my sense is Allen Edmonds shoes and their refurbishment program ain’t what it used to be. I have one Allen Edmonds, one Magnanni, and one Johnston & Murphys. The first two were bought for less than $10 and are ‘worth’ well into the $300s. The 3rd is worth the least and ironically I paid the most ($20). Passion is certainly very important. I think with financial matters its important to keep your passion alive, but also remembering where to focus your heart and mind. Money in and of itself is not the goal, but the security and content life it can lead you with is what really matters. Keep the passion for money alive, but remember why you are working through the struggle as well! Whoa dudes. Allen Edmonds are not that durable. I own a dozen pairs. Park Aves to Cordovan Leeds. I should photograph them lined up on the bondo flooring. Anyhow, the leather soles wore ok on the carpet at the office but my afternoon destress walks (while working) wore the lowers out. Refurb was hit and miss. $100 for new cork and soles and cheap spray paint yuck on the uppers. The uppers last well if you don’t scuff them up. Stitching is ok. But by all means, don’t expect durability of Jacobs hiking boots. Allen Edmonds are NOT durable. I get about five resoles out of a pair before I donate them. Cordovans are more rugged. Ttougher stiffer uppers, thicker lowers. I guess you can get full rubber soles but I find them vulgar on a blucher or balm. Now I wear Keens Newports everyday. Those lowers outlast the upper. “25*” is on the wrong side of the equation in “25*income generating assets > regular expenses”. Cheers. I think the problem with a lot of people and “passion” is, they burn out quick. I’d like to say I’m passionate about ER, especially when I look at the dismal state of affairs in my occupation. I have bursts of extreme frugality and razor sharp focus…but then I lose steam. I think the better analogy for success is changing the mindset. Tony Robbins (I’m not sure how you feel about him) had a youtube video that touched on what I’m getting at. Basically you have to change who you are and what your standards are. If you are (or become) the kind of person that lives on $17,000 then it’s not hard for you. If you are not, then it is. It’s just who you are. So I’m working more on just changing who I am rather than depending on burst of passion. Nice post…From our personal experience, having passion to succeed greatly impacted our ability to accomplish our goals. When you want something really bad, you’ll likely give 110% to achieve it.